Letters by a modern St. Ferdinand III about cults Cyanobacteria and disproving Evolution. Nano-Technology does not 'evolve' by chaos. Cyanobacteria and disproving Evolution. Nano-Technology does not 'evolve' by chaos. How did the various proteins, chemical compositions including chlorophyll, and other systemic parts arrive by random chaos within Photosynthesis? How would that system 'evolve' ? If any part of it is missing it is useless. It is all or nothing. Cyanobacteria or blue-green algae, which in the Evolutionary fable 'evolved first'; apparently developed 'over time' into Hillary Clinton. Sadly for Evolutionists such a process has never been observed nor replicated and is bio-chemically quite illiterate. Cyanobacteria use photosynthesis to manufacture themselves. So not only do Evolutionists have to prove that the complexity and Black Box of photosynthesis 'evolved' from nothing; they now need to prove that single cells developed from nothing, and further that the first cells used the technology of photosynthesis to make themselves. The mathematical probability of any of the above happening is less than zero. Axe count some 417 moving parts within the cyanobacteria's process of using sunlight and oxygen to make more cyanobacteria. 417 pieces of nano-technology. This would be akin to having a bicycle reproduce itself. It is impossible. Complex and compressed embedded systems. IOT devices are much in vogue – running in your car, your phone, even your doorbell and being networked. They pale in comparison to the embedded and compressed nature of the hardware and software running blue-green algae. Your iOT camera did not evolve by randomness. It is therefore highly logical to assume that something more complicated such as cyanobacteria did not as well. 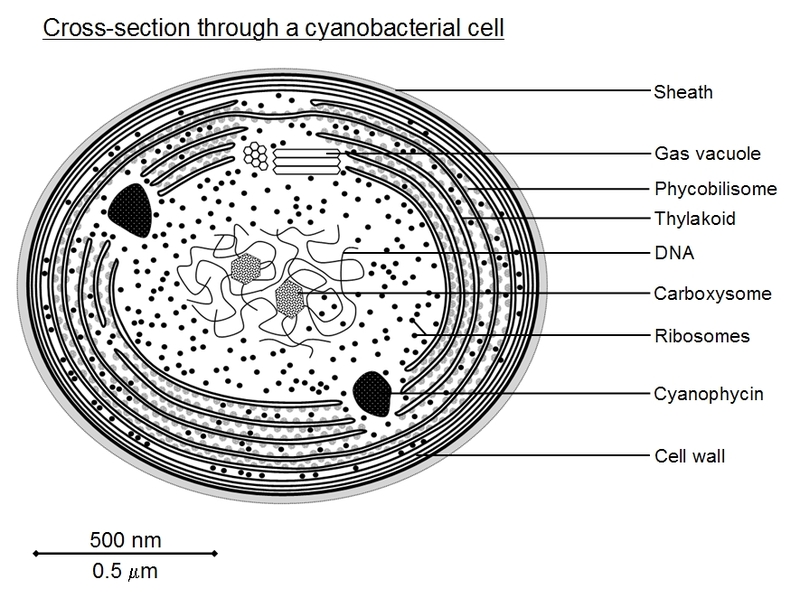 Further, cyanobacteria today, which are the smallest single celled organisms, are exactly the same as cyanbacteria yesterday, 100 years ago, 1000 years ago.....the question is – where is the evolution of cyanobacteria ? There is none to be viewed. It has never been proven that complex nano-technology can 'evolve' by chance. It is just assumed. Not a single experiment has taken 'nothing', or dead matter and created cyanobacteria. Not one. Fairy tales and stories, along with pretty pictures, is not science. 9/28/2016: Cyanobacteria and disproving Evolution. Nano-Technology does not 'evolve' by chaos. 9/5/2016: Bananas and Chimps are the same as humans! So says the 'science' [fiction]. 8/29/2016: Evolution's Fantasy world. A pagan religion, not a science. 3/28/2016: Evolutionists admit single cell is too complicated to develop from 'nothing'. 2/10/2016: Apes to Men myths, bio-chemically impossible. 11/22/2015: Nobel Prize for DNA self-repair. Evolution offends basic bio-chemical science. 11/16/2015: Software and cellular repair - both offend the cult of Darwin's simplistic view of life. 11/15/2015: Water: Darwinian theology cannot explain the core miracle of life. 10/17/2015: Evolution's illogic and lack of ontology. No science here. Meet the platypus. 10/11/2015: So you are a rational-scientist-enlightenment-realist ? 10/3/2015: Darwin's cult is mathematically impossible. It also offends basic science. 9/26/2015: Everett Koop and the bleedingly obvious. The cult of Darwin is not based on science. 8/15/2015: Darwin's cult is long dead. Time to move on. 7/30/2015: Everything proves Darwinism! A typical cult belief. 5/20/2015: From E Coli to Yeast and Humans ? 5/10/2015: Dr. J. F. Ashton, 'Evolution Impossible'. 5/2/2015: Darwin's magic friends and going from grass to humans! 4/27/2015: Complex information systems arose by random chance! No science here ! 3/26/2015: Evolution propaganda is anti-science. It retards scientific inquiry. 3/20/2015: Stephen Meyer, Signature in the Cell. The Magic Fairyland of Darwinism. 2/27/2015: Nazi Darwinism. Borman and the Nazi hatred of the Church. 2/13/2015: Evolution is a Fraud and Non-Science. 1/19/2015: Ribosome's and the cell's factories - all by random chance and luck! 12/12/2014: Darwin's Dissenters. Surely the cult will punish them. 12/10/2014: The unscientific cult of the Phd. Quackery and letters do not make science. 12/4/2014: Hitler the Atheist Evolutionist and Darwin cult member. 9/16/2014: Apes did not 'evolve' into humans. Genes and our software make this obvious. 9/3/2014: The fossil record does not support Evolution. Neither does reality. 7/31/2014: Darwinism-the greatest joke er hoax on earth. Particles to Professors you say? 5/22/2014: Conway: 'The Nazi persecution of the Churches' - What else would good Darwinists do? 4/4/2014: Co2 was much higher in times past, today's level is 'below normal' so why the fuss ? 3/28/2014: List of Evolution's better known frauds. Criminality is now Science! 10/17/2013: The cult and illiteracy of Scientism. Quacks as experts. 8/22/2013: Darwinism, beyond faith into fantasy. 7/19/2013: Evolution is science ? So too are little green men from planet X. 7/9/2013: Michael Denton, 'Evolution: A theory in crisis' – No kidding. 5/4/2013: The cult and theology of Darwinian stage theory. Junk and Bunk as 'science'.